Home carpet cleaning machines come in different shapes and feature combinations, depending on the needs of the user. If you are interested in getting a good machine, here is a guide to learn more about the product before actually deciding to make a purchase. Skip ahead to see the 4 Types Of Home Carpet Cleaning Machines. Home carpet cleaning machines allow users to shampoo and deep clean their carpets with a process similar to what professional carpet cleaners use called hot water extraction. Regular home carpet cleaning machines look like an upright vacuum cleaners. However, what they do is different from regular vacuums. There is a brushing feature, and water extraction power. After agitating the dirt off the carpets, the home carpet cleaners will suction in the dirty water and detergent mix that have been used for cleaning the carpets. The cleaning cycle can be repeated, or else a rinse (no detergent) cycle can be run to clean out the detergent thoroughly from the carpets. 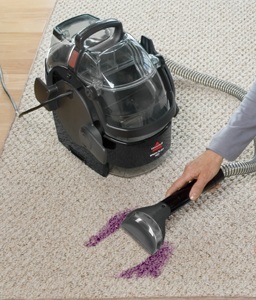 SpinScrub brushes on the Hoover SteamVac with Clean Surge agitate and loosen dirt from all angles. The dirt and stains are then suctioned away. The rotating and/or vibrating brushing technology and water extraction process is extremely powerful. Many users are extremely satisfied with their home carpet cleaning machines, reporting outstanding cleaning results that rivaled what the professional cleaner was able to deliver. Hot water extraction or carpet steam cleaning is also considered to be a safe carpet cleaning method as most of the toxic carpet shampoo chemicals are extracted and removed. For added peace of mind, home users can run extra rinse cycles (using water and no detergent) and use only carpet detergents that are safe for pets, kids and adults. The cleaner releases and injects a cleaning solution of mixed water and detergent into the carpets. The carpets are scrubbed from all angles through rotating brushes to clean the carpets, and remove all pet stains, food stains, coffee or juice spills and other bad stains. The brushing and vibrations jostles the dirt off the carpets in a way that is efficient and effective. Once this is done, the suctioning power of the cleaner automatically absorbs as much water as possible, including the collection of dirt and debris, to leave the carpets clean and refreshed. Why Home Carpet Cleaning Machines? 1. It lengthens the life of the carpet. With frequent cleaning, homeowners can easily remove any stains, preventing them from replacing the carpet altogether. 2. It’s easy to use. It only requires mainly filling/emptying the tanks and moving the cleaner in a sweeping motion to get things done. Moving the heavy furniture may not be necessary. 3. Stain removal. 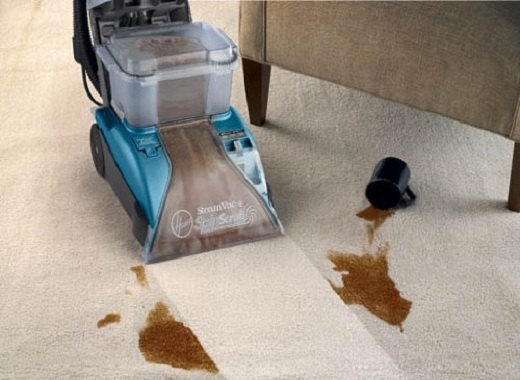 Some home carpet shampooers are specifically made for hard to remove stains. They are ideal for homes for dealing with stains from pets, or spills and carpet accidents from children. 4. Removal of allergens. Carpets tend to collect dust, mites, pollen and various other allergens. This can be dangerous in households, especially if you have sensitive children. With the carpets kept clean, parents can be sure that their children can safely play on the floor. Mold growth is another dangerous possibility in homes. The fibers can often trap a lot of moisture, encouraging the growth of mold. With carpet cleaners, any pollen can be easily removed, ensuring that there is no growth. 5. Cheaper than renting or professional services. A good regular home carpet cleaner costs less than $200. This provides much more value than using professional cleaning services that cost several hundred dollars each time. Carpet cleaner rental costs can add up over time to outdo the cost of having a cleaner at home. 6. Convenience & Exclusivity. It’s handy to have a cleaner around in case spills and stains occur. The machine is also exclusive to your home. Users don’t need to fear dragging in the dirt from other homes through rental or shared use machines and equipment. Most users of home carpet cleaning machines find them easy to use. There may be an initial set-up to assemble the cleaner out of the box. It’s typically straightforward and requires nothing more than a Philips screwdriver. 1. Remove all the furniture first or at least cover the leg portion of the tables and chairs. When detergent and liquid is introduced to the carpet, this may cause the furniture’s color to erode, staining the surface further. 2. Vacuum the carpet first to get rid of any dust or dirt that lies on the surface. The carpet cleaner will take care of the deep fabric cleaning. 3. Once vacuuming is done, follow it up with the carpet cleaner, making sure that all parts of the carpet have been passed on. It’s a good idea to work in a system, starting from inside and working your way outwards. A more detailed step-by-step guide is available through the How to Use a Home Carpet Cleaner Machine guide. Professional grade upright deep cleaners – Professional or light commercial carpet cleaners are well-constructed heavy duty machines that cleans the best out of all classes of home cleaners sold. They also last much longer. The downside is their higher costs, which is around $400 – $500. The two most well-known high grade cleaners are the Rug Doctor or Bissell Big Green Deep Cleaning machine. You can find a comparison of professional vs. regular upright carpet cleaning machines or view the best professional/ light commercial machines here. Regular upright deep cleaners – These are most commonly purchased for home use, as they provide a great level of cleaning power at a reasonable price. Some users actually say they got better results with these machines than a professional grade cleaner like the Rug Doctor or a professional cleaning service. At $150 – $250, they provide the best value for the dollar. Check out these Best Carpet Cleaning Machines Reviews to see the Hoover Carpet Basics Power Scrub or Hoover SteamVac and Bissell upright cleaners. Lightweight upright cleaners – Lightweight upright cleaners typically have less power than regular upright cleaners, but they still do a great job. They are built a few pounds lighter than a regular deep cleaners, and therefore more easily carried around and maneuvered. These are great for fast spot cleaning of smaller stretches of carpets or for smaller dwellings without a lot of storage space. They typically cost around $90 – $130. Check out this list of the best Lightweight Carpet Cleaners. For specific examples, check out these Bissell Lightweight Carpet Cleaners. 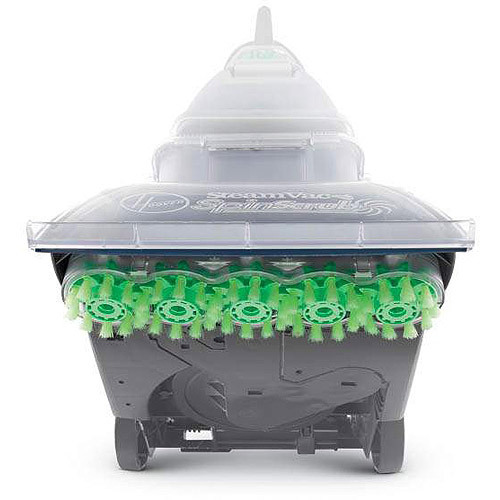 Currently, regular upright deep cleaners have advanced to a level where they pack in greater cleaning power while weighing even less than what was once considered “lightweight” models. 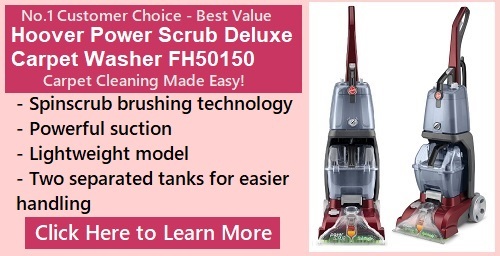 One example is the Hoover Power Scrub Deluxe Carpet Washer. Portable spot cleaners – These are very lightweight portable machines that specialize in cleaning out spots and smaller stained areas of a carpet, stairs, upholstery or for auto interiors. They are not meant for cleaning out entire carpeted floors, but do well to keep spots and stains off a carpet. They are also suitable for cleaning out spots in between more serious carpet cleanings. They typically cost around $100 – $130. To learn more, check out the Portable Carpet Cleaning Machines Reviews section. 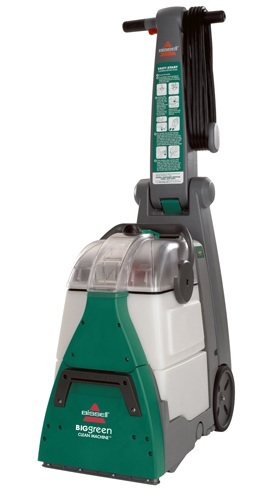 If you really can’t decide, Bissell has a hybrid “LiftOff” model that fits a portable unit inside the frame of a full-sized upright deep cleaner. You can use this hybrid unit just like an upright deep cleaner for cleaning large areas and rooms. For smaller spots and occasional stains that arise, you can “lift off” the portable unit and bring it to the affected spot for a quick clean up. To learn more, check out our full Bissell LiftOff machine review here. Some readers are specifically looking for a carpet cleaner that does “pet carpet cleaning” for stains like pet urine, poop and other messes. All classes of carpet cleaners, whether professional, upright or spot will be able to clean pet stains. Pet Carpet Cleaning – Some readers are specifically looking for a carpet cleaner that does “pet carpet cleaning” for stains like pet urine, poop and other messes. All classes of carpet cleaners, whether professional, upright or spot will be able to clean pet stains. Carpet cleaning machines are not necessarily labeled as “pet” models. It is commonly understood that a main reason for people needing a carpet cleaner is to remove pet stains and odors. The main key to remember is to pretreat the spot and use pet cleaner formulas for better results. You can find more detailed information in our Pet Carpet Cleaner Machines guide. Determining the type of carpet cleaner to purchase is the first thing to consider when shopping. There are other factors involved as well. To see a comprehensive list, check out the Carpet Cleaning Machine Buyer’s Guide. Check out various types of upright, portable spot and combination cleaners in the Bissell Carpet Cleaning Reviews section.